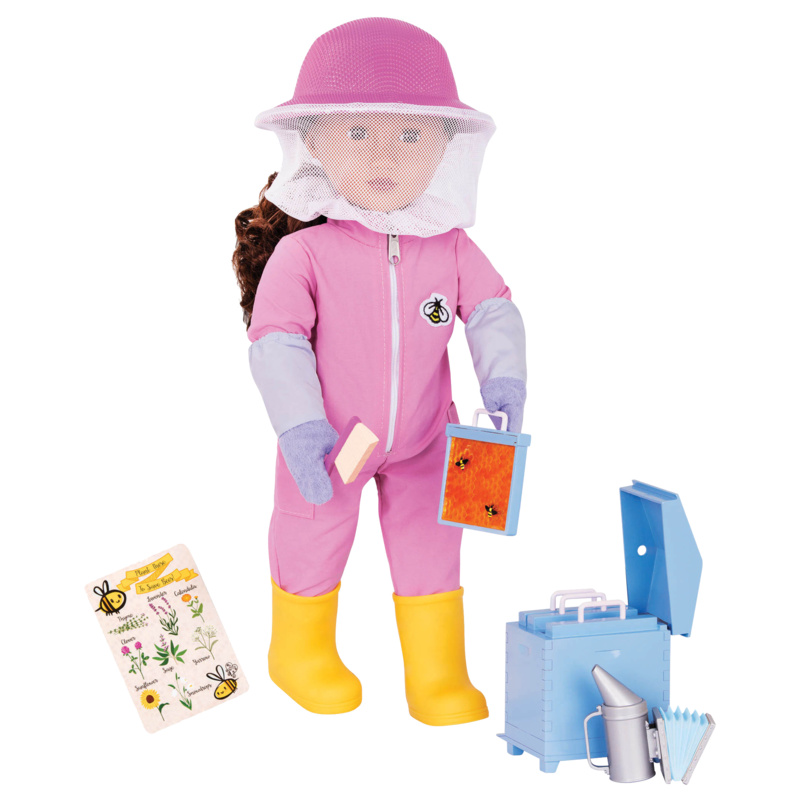 You'll be buzzing with excitement when you play with this 18-inch Beekeeper doll! Bee the best you can bee! 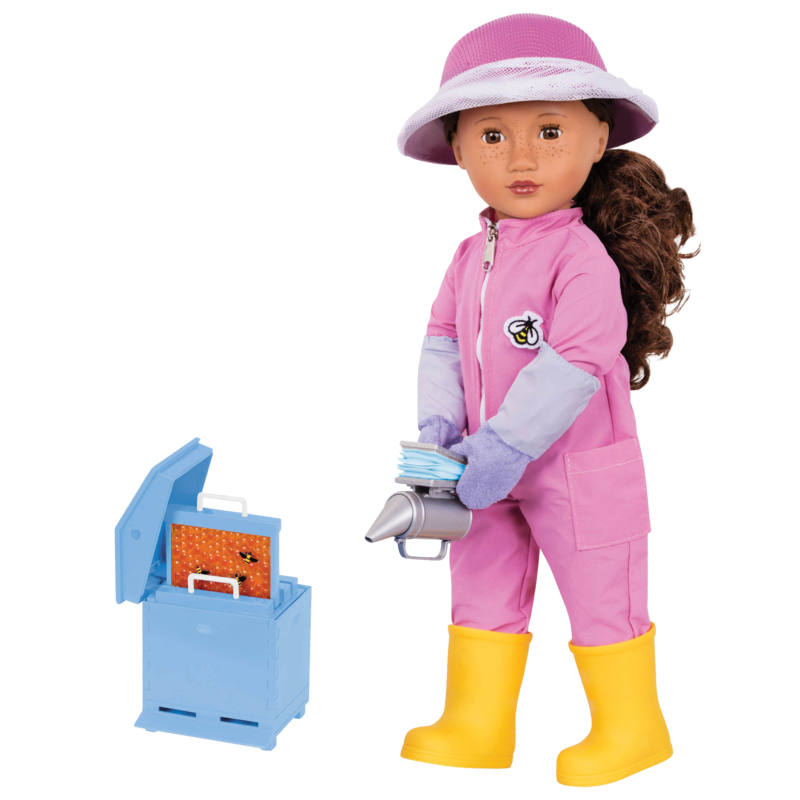 Meet a doll that’s as sweet as honey with Our Generation’s Melina – Beekeeper Doll! 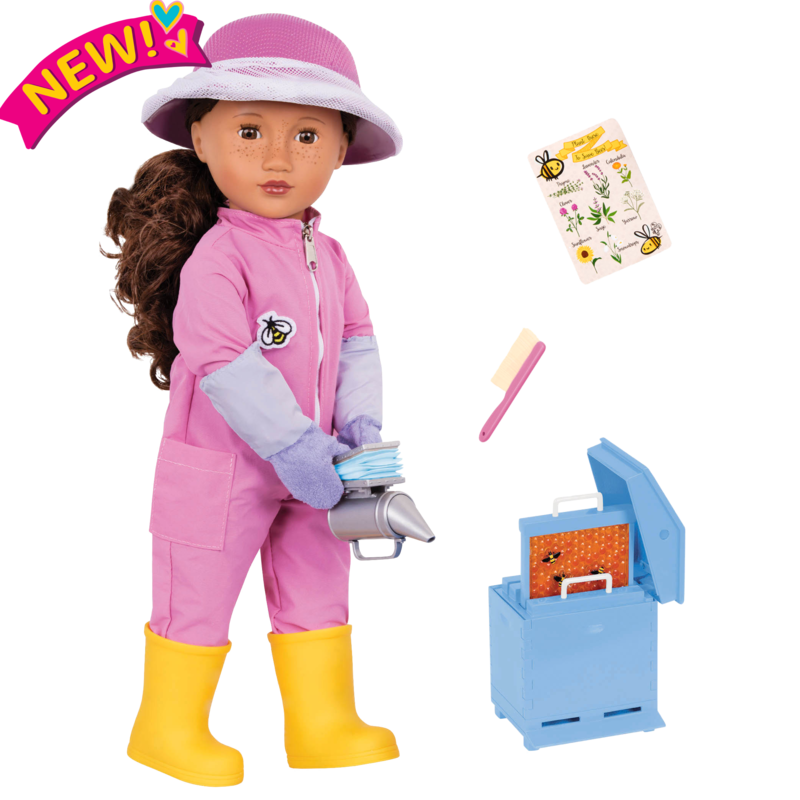 This 18-inch doll is ready to explore the buzzing world of beekeeping with you! Because we’re a very special generation of girls, aren’t we? We don’t feel the need to define who we are. We’re just us, and proud of it! We love to do our hair, wear skirts, and dig in the dirt (occasionally all at the same time, if we feel like it.) We’re curious about laser beams while we’re chasing after our big dreams. This is our time. This is our story. Beekeeper Accessories for 18-inch Dolls! What do we have in common with bees? We love flowers, too! Melina has long, curly brown hair, lovely brown eyes, and a scattering of freckles across her nose. Safety first! Melina’s outfit helps her avoid any surprise visits from her bee friends. 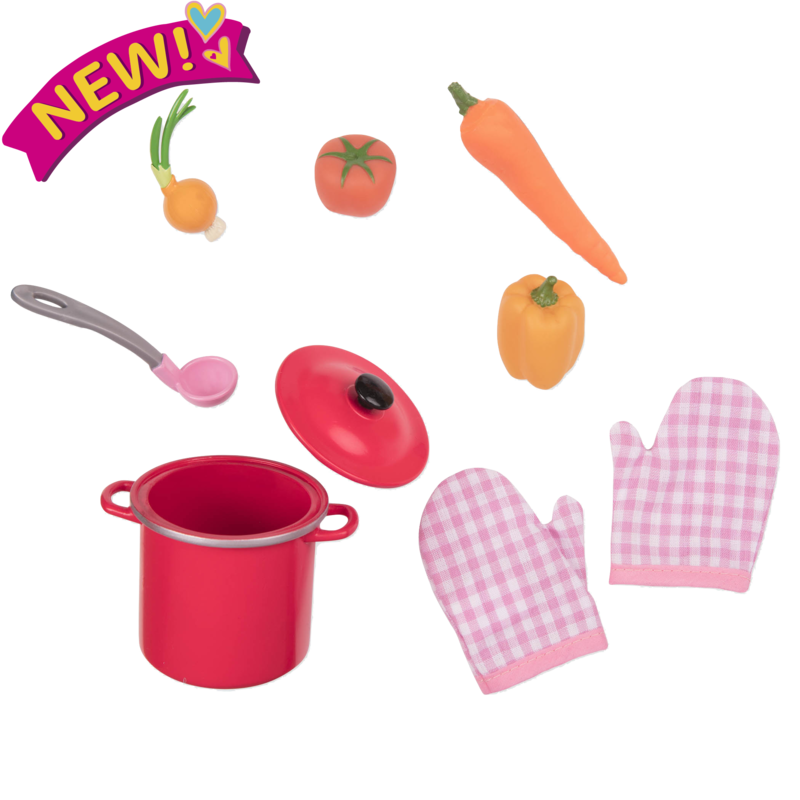 She comes wearing a bright pink zip-front jumpsuit with a cute bee emblem, a pair of rubber boots, elbow-length protective gloves, and a beekeeper hat with mesh. She loves to dress up in all kinds of fun clothes once her beekeeping is done. Join Melina as she takes great care of her beehive – it has removable honeycomb frames so you can collect honey and check out the bees inside! 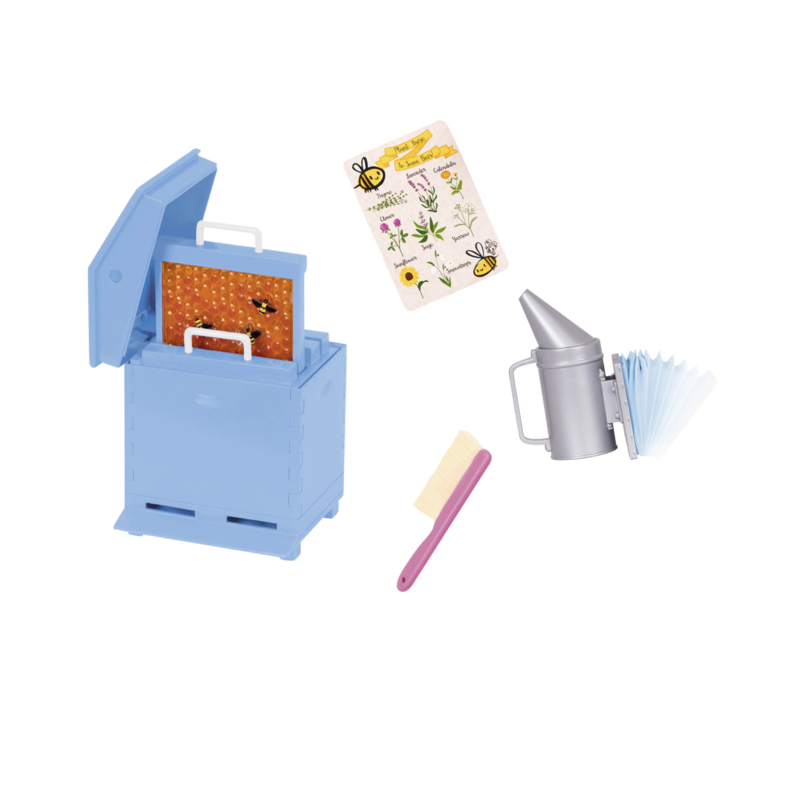 Use the beehive smoker and brush to assist you in your tasks. Did you know that the art of raising and caring for bees is called “apiculture”? There are so many fun facts to learn about beekeeping! 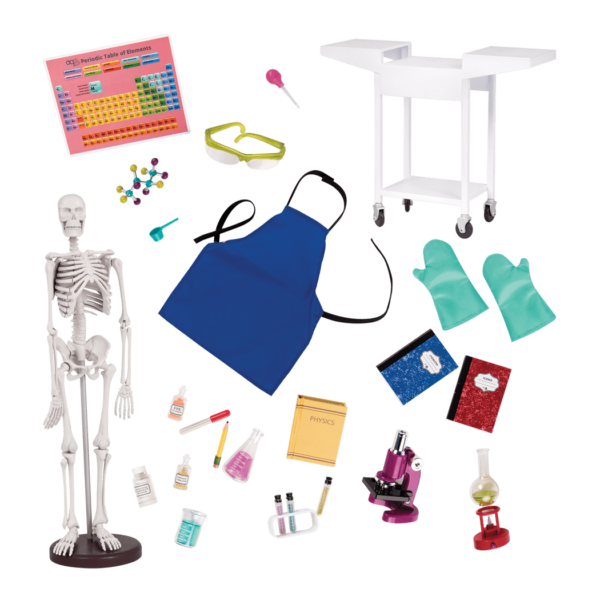 Melina is part of the Our Generation Professional Dolls Collection, a group of exciting dolls that are following their dreams and exploring all kinds of great professions. Beekeepers like Melina love flowers, because they know that bees need them to make food for themselves and to produce honey for us! The Way to Grow garden accessory set can help Melina grow a garden full of gorgeous, pesticide-free blossoms for her bees! Accessories like the mini wheelbarrow and garden gnome will help Melina grow a great garden in no time! Mmmmm, honey! Even one beehive can make a LOT of honey! Melina likes to see her extra honey at the farmer’s market using the Farmer’s Market Set! This pretty market stall is the perfect place to display the organic honey produced by Melina’s bees, and also find a great loaf of fresh bread to eat dipped in honey! Isn’t being a beekeeper so cool?!? Melina loves to style her hair in a lot of different ways! For dolls like Melina with curly hair, we recommend using a wide-tooth, flexible comb and always working with very small sections at a time.